No, not the type that was heralded by Hillman, Herbert & Cooper’s Premier in 1886, but the more sophisticated version that really began with F. Bowden’s 1894 patent for the lady’s Raleigh. Although Bowden was granted the palent, G.P. Mills took the credit for the design. There was apparently no development until 1898, when the well-known Raleigh cross-frame appeared; it was to last for about 40 years. 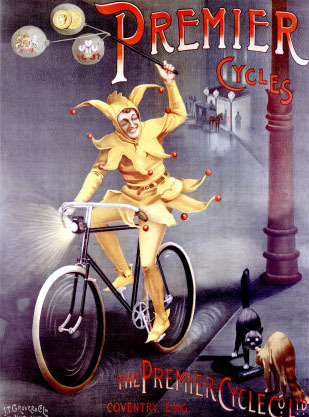 Chater-Lea used the Bowden patent, the Cycle Components Co used the Morris. “In your issue of September 16th you refer to Mr. G. L. Morris as the designer of the celebrated Centaur cross-frame, and we must ask you to kindly correct that statement in your next issue. The Centaur cross-frame was designed solely and entirely by Mr. George Gilbert, the Managing Director of the Centaur Co. and at the time he designed this frame he had never heard of or seem any design of Mr. Morris’s. In fact the two men are still strangers to each other. The Centaur cross·frame was not only designed, but also made, and put on the market, before Mr. Morris appeared in the matter at all. His intervention arose in this way. When the Centaur Cycle Co. applied to the Patent Office for registration of their design, which they believed, and still believe, to be entirely new and original, the Registrar stated that a frame had been registered somelime previously by Mr. Morris, which, in his (the Registrar’s) opinion bore a sufficient resemblance to the Centaur Co’s design to justify him in refusing a separate registratton without Mr. Morris’s consent. Mr. Morris, perhaps not unnaturally, turned the situation to his own advantage, and refused the consent to the registration unless he received a monetary consideration. This being arranged, the Centaur Co were granted a separate registration in their own name of their cross·frame design. We may add that for 1909 the Cenlaur Co will substitute a new pattern frame for their Featherweight model in place of the one with which the name has been assoclated during the past few years. The only criticism of the original de!ign was that, owing to the main tubes being crossed, a somewhat undue degree of vertical rigidity was caused. Several alternatives have been tried, and al last a design of frame has been decided upon which, while giving increased lateral strength, and immense strength for the back of the frame. through which the pedalling strain has to be transmitted, does not increase the vertical rigidity in excess of the ordinary diamond pattern”. Anyone who has ridden both types of Centaur may wonder at the change. The answer may lie in road conditions at that time. Although Raleigh stuck t0 rigidity, other firms, such as Triumph and James, even fitted a downwards-curved top tube to give flexibility – the 1909 James cross-frame safety was practically a Centaur with a curved tube. It is interesting to remember that when Hetchins introduced their curved seat-stays and chain-stays claims were made of both extra flexibility and extra strength; I can’t remember any cycling paper at that time pointing out the absurdity of the claim, as would certainly have happened had anyone had the affrontery to make it in 1908. But issues of frame strength continued to dominate public concern, and in 1898 Raleigh introduced a new variant of the cross frame. It was immediately copied by other manufacturers. Some were outright copies, resulting in patent litigation. 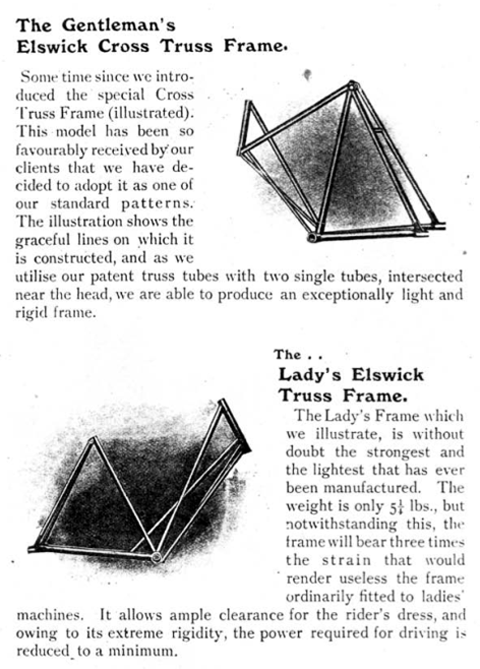 Other companies, such as Referee, Centaur and Elswick built their crossframes with different construction principles to avoid patent infringement. A British patent by Guest & Barrow (below), approved in Great Britain in 1889 and in America in 1890, was referred to when some companies registered subsequent cross frame patents. Guest & Barrow, of 276 Broad St, Birmingham, registered the Ariel trademark in 1893, but the company closed in 1894. Dunlop subsequently took over the Ariel name, forming Ariel Cycle Co in 1896, and Cycle Components Mfg Co acquired Ariel Cycle Co in 1897. Although Derek Roberts explains that Components Co Ltd used the Morris (Referee) cross frame patent, I found a 1901 US patent application by Charles Sangster for a slightly different cross frame design. Elswick managed to avoid infringing both Raleigh and Referee patents because of the unique design of their down tubes.